I woke up early that morning and went to the shuttle pickup at Marriott to Javits. The shuttle arrived later than its supposed 7am schedule which was ugh but it was fine because I met a lovely couple- veterans of BEA who talked to me about what to expect when I get there. On the way to Javits in the shuttle, I already got to chat with some fellow bloggers, Jen of Library of a Book Witch and Ariana of The Bookmark PR. When we arrived at Javits *cue internal screaming: I’M HERE THIS IS REAL THIS IS HAPPENING*, we got our badges and then headed for the Blogger Continental Breakfast together. We also met Kel of Booked Til Tuesday then. Finally, my designated BEA buddy, Louisse of The Soul Sisters, arrived and joined us. After awhile, the keynote session began. Thea James of The Book Smugglers moderated the panel consisting of: Kameron Hurley, Ron Hogan and Patty Chang Anker. Their discussions were insightful ranging from topics about blogging schedule, obligations but more importantly what the future holds for book blogging. During the time we were at the Blogger Con keynote, the line for Truthwitch and the exhibit hall was building up. Since both Louisse and I really wanted to make sure we get a spot for the Truthwitch signing, we lined up at around 10am (the line was already very extensive!) even though the exhibit hall wouldn’t open until 1pm. The wait wasn’t all that long because we hung out with a fabulous group of bloggers from: Tawney of Twinning for Twins, Kathy of A Glass of Wine, Jess of Read My Breath Away (who I got to work with on her blog design! ), Ciara of Lost at Midnight and Tabitha from Tabitha’s Book Blog. When the showfloor finally opened, everyone was in a mad (and by mad I mean insane almost-stampede) rush and people were running to the Macmillan booth like hell and Louisse basically had to drag me because I’m a slowpoke. Looking back, that moment truly was so comical and just really crazy. Thankfully, we both secured tickets for the Truthwitch signing and it was just such a huge relief. 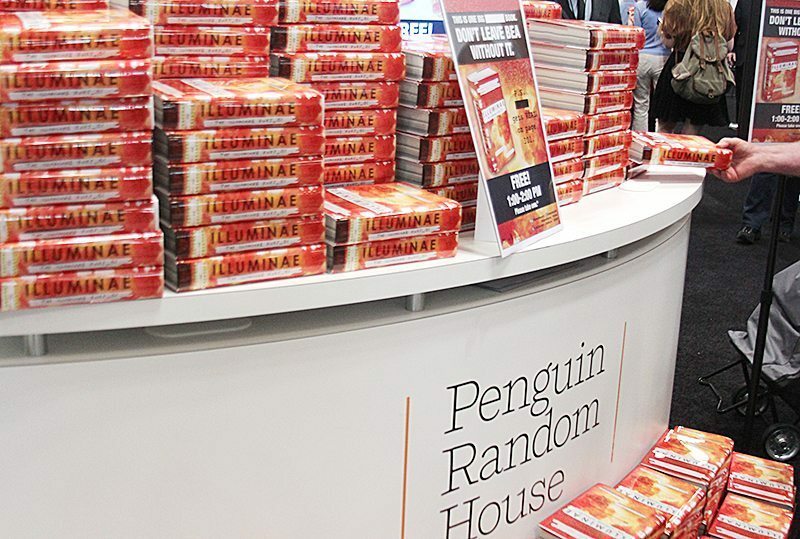 Louisse and I looked around the exhibit hall after that, first stopping by the Penguin booth to grab Illuminae. Those books went by really fast but I think they actually had many stocks and were just reserving it for the next days. I’m thankful for the free wifi at Javits because at some point I lost Louisse while checking out the other booths. I was just so easily distracted by the pretty books! 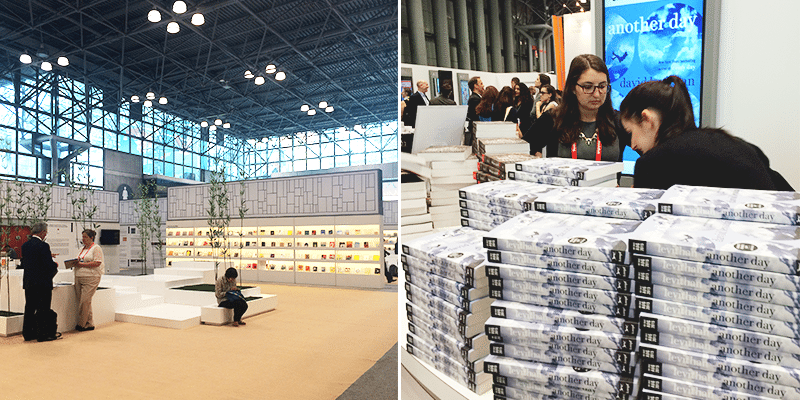 In the single hour that I trudged through the exhibit hall, I already had two bags of books. I don’t even know how that happened. Around 2pm, I went back to the BloggerCon area, where my panel with Ashley of Nose Graze and Stephanie of These Paper Hearts, Going Beyond Blog Formatting, was supposed to be. I met Ashley and her mom, then Stephanie shortly after, and we got ready to begin. Since our session overlapped with exhibit hall hours, the attendance wasn’t as great as the morning panels which was disappointing. We still had a great panel though because our slides, which we worked together on, were well-prepared. Ashley and Stephanie are both coding rockstars and it was such an honor to have been able to speak with them. Our audience, though not very huge, was participative at least when Stephanie quizzed them. 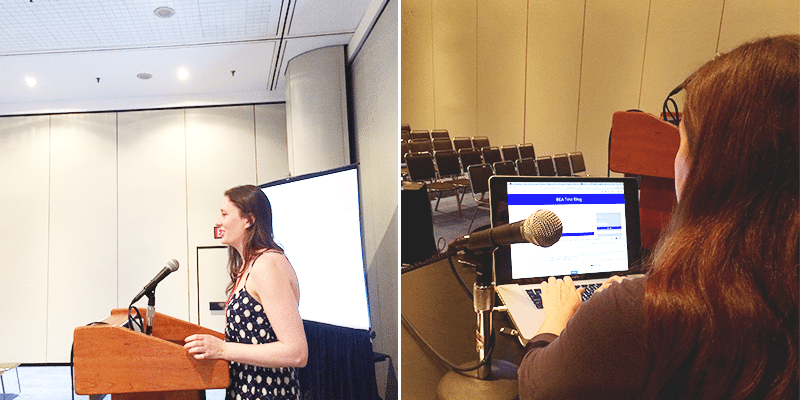 I think those who attended really acquired some great info about how they can use coding with their blogs- and well, too bad for those who didn’t LOL. If you missed our panel and you’re interested in learning about what we discussed, you can access our slides on Ashley’s BEA page. I went around the exhibits again, chatted with some publicists, got some galleys I really wanted and explored the China section. 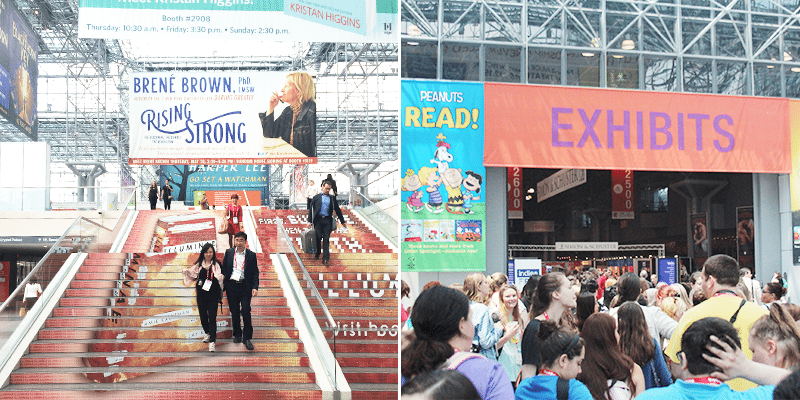 When my feet were finally too tired from walking around the BEA show floor and my arms were aching from the heavy bags of books, I went back down to the Blogger Con area where they had popcorn and drinks. I didn’t go back after that and instead took the shuttle back to my hotel. I think the first day was the craziest for me- in terms of number of books I got (30! Just check out my BEA 2015 haul.) and just the general madness when they opened the show floor. Weirdly enough, I wasn’t that tired from it and even was able to watch a broadway show after. Anyhow, watch out tomorrow for my Day 2 recap! Oh and here’s a giveaway of one of the ARCs I got from my first day at BEA, Siren’s Fury by Mary Weber! Those muffins look amazing! Haha! Glad you had so much fun! 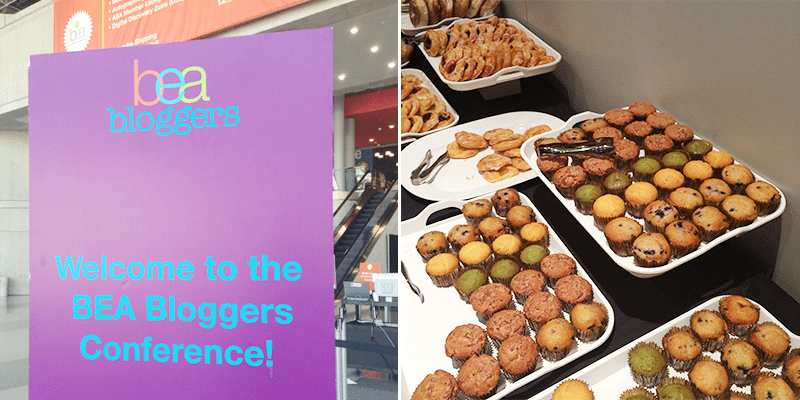 Free food at BEA- definitely one of the highlights at the event because most days I was starved from walking around Javits. Thanks for dropping by to check out the recap, Inah! It seems like you had fun! I’m sooooo jealous!! :) Thank you for the giveaway. This looks like so much fun! I wish they had events like this in the UK. It was absolutely fun! I wish they had such events in the Philippines too but alas. And yes free food is always a great plus! 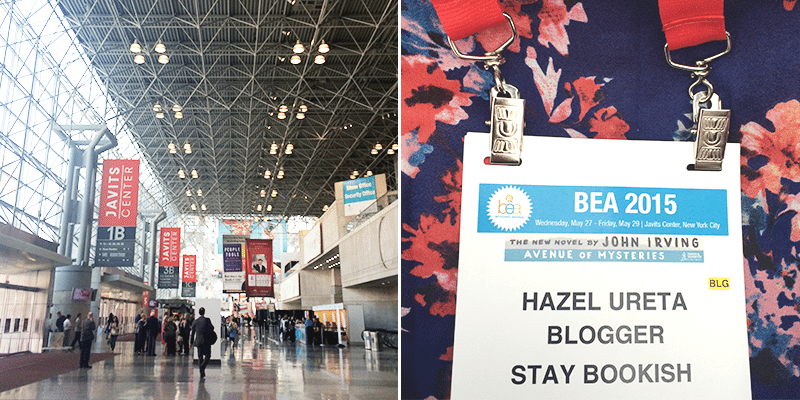 Your day 1 recap of BEA is so awesome can’t wait to read more of your BEA adventures. But if you don’t mind me asking how do you get those books from BEA? Are all those for free? 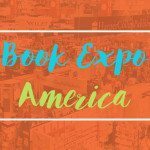 Do you need to get passes for each book you can get, passes for each signing you want to go to or or you just grab ’em? Huhuhu I am dreaming of one day being able to attend BEA but is it even possible if I am not even a blogger? And can you give any idea on how much the entrance fee for BEA would more or less cost? YAY for having an amazing first day!! I was rather bummed that the did BloggerCon and BEA half day like that because I would have wanted to attend BloggerCon but the Truthwitch ticket took precedence over almost everything else! I hope you had an amazing day one at BEA as well, Pili! I was so bummed about it the BloggerCon/Exhibit overlap but really couldn’t help but prioritize Truthwitch because I really wanted to read it and I doubt pubs would have extra review copies they could mail to the Philippines if I requested, given that kind of demand. It was so nice to meet you, Hazel! (And YAY TRUTHWITCH)!!! 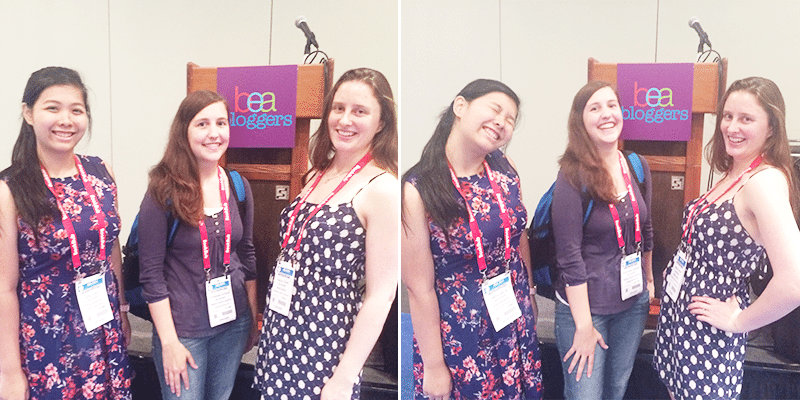 I’m glad you had fun at BEA and that it was worth flying all the way over for. I’m sorry there weren’t more people at your panel (they really should rethink conflicting things with the exhibit time; that’s such a bummer) but I’m glad it went well and I bet you three were great! Do you have to buy tickets for BEA? It seems like so much fun, though I don’t envy you carrying all the books around? Did you have space in your luggage to bring them back? Yay for BEA day 1! I’m still so thrilled you were able to come for BEA this year. It’s quite the experience, isn’t it? I’m sorry I couldn’t be at your panel, but I’m sure you all were FANTASTIC. Amazing! The Illuminae ARCs look so pretty! This looks so amazing! And a 30 book haul in one day 0.0 I’m so jealous! Oh my gosh, those Illuminae arcs are so beautiful! Glad you had a great time! I definitely would have been running for Truthwitch and Illuminae! How awesome is it that you get to meet all these amazing authors and score all the books too? BEA looks absolutely amazing. I’m incredibly jealous you got to go! It’s definitely a dream of mine to get there one day! 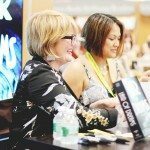 I am so envious, I could only wish to be able to attend at BEA looking at all those books and authors in one place…OMG that’s like a dream! Jealous that you met Nose Graze! I adore her! And wow your photos are amazing. Love the stairs picture that shows Illuminae cover. You’re so very lucky you got to go at BEA! I’m so jealous! Thanks for the recap, this way I can pretend I went too! 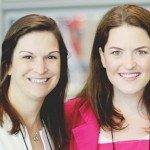 Congratulations on being apart of bloggercon! As a blogger/designer that’s such an HUGE accomplishment! I hope you grabbed an ARC of Another Day by David Leviathan, because Everyday by him is truly amazing. These pictures are just making me even more excited for next years BEA. I sooo can NOT wait! Wow, you’re so lucky! I feel so jealous. :( That might be an awesome experience. I also wanted to go. Sometimes I think that it’s better if I ditch school and become a full-time book blogger. But no, I’m just kidding! HAHAHA! You’re so lucky! It looks like so much fun. I haven’t heard that much about the blogger portion, so I am glad you shared from that. I am definitely going to BEA next year. Great post! I think I would’ve fainted from the adrenaline of it all! :D But glad that didn’t happen to you and that you enjoyed every second of it. Im always jealous seeing everyones pictures from BEA. Looks like you had a lot of fun! 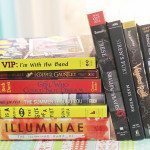 Truthwitch and Illuminae are some of the books that would have been at the very top of my list if I had gone! Maybe I’ll get to go one day! 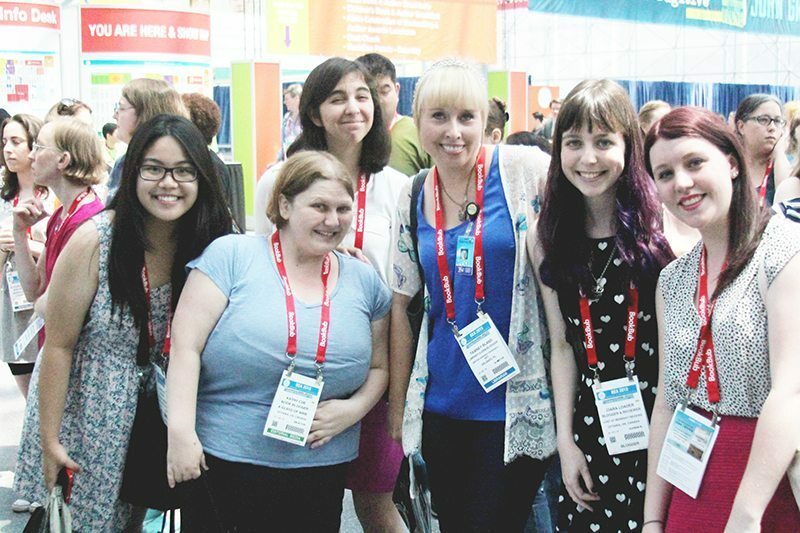 That’s so awesome that you had a panel at BEA! It must’ve been a crazy yet awesome experience :D I can only imagine the stampede of people getting those Illuminae arcs! I was watching some BEA book haul videos and it was a gorgeous HARDBACK ARC!? Wow. That’s the first time I’ve seen a hardback arc. aghhh!!! PRECIOUS ILLUMINAE ARCS! :) That badge of yours too!!!!!!! I love that you got to meet Susan Dennard! I haven’t read her books yet (I know, I’m an awful person) but she’s so lovely! Hello! 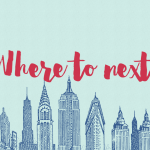 It seems like you had such a fun time at BEA/BookCon! I think it’s so cool you got a ton of books, was part of a panel and met Susan Dennard!! one day I’ll make it to BEA. I am so jealous! You did have one wonderful experience.